Let me come clean. Every time I visit the Metropolitan Museum, I skip the galleries displaying American art, and until recently, it was the same with the Huntington in San Marino. I would spend most of the time there savoring the world-class collection of English paintings and then finish by looking at a couple of temporary exhibitions. Not any longer. 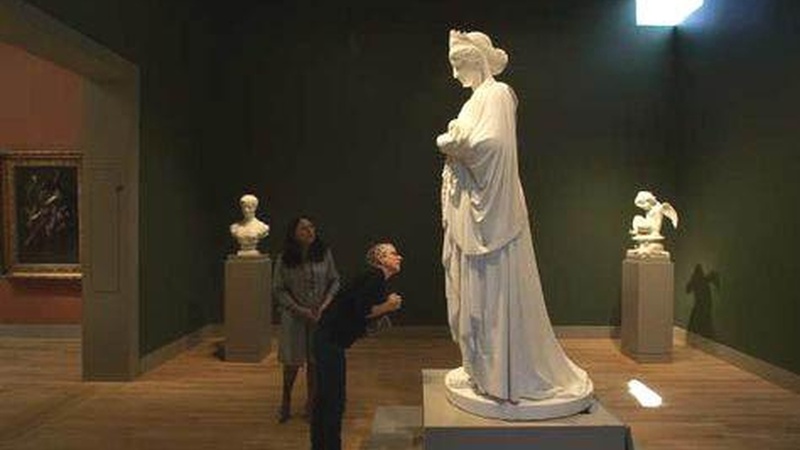 Last week, the Huntington inaugurated the new Virginia Steele Scott Galleries, where for the first time in my life, I had the chance to see classical American art presented with such panache and sophistication that it changed my previous opinion of its relevance in the grand scheme of things. The refurbished galleries, with their elegant, contemporary design, provide more than 16,000 square feet of exhibition space. Usually we see collections of American art presented in rather crowded rooms, giving off a whiff of provinciality, but here at the Huntington, every object had particular appeal, thanks to the way it was placed, lit, and juxtaposed with the other works of art. When museum curators excel, as is the case here, it allows us to see the familiar in a totally new way; I found myself spending time in front of paintings I had previously ignored and even enjoying the displays of decorative art, which is normally not my cup of tea. Next year will bring a dramatic change in the presentation of the permanent collection at another local museum, the Los Angeles County Museum of Art. When construction is completed on the new Resnick Pavilion for temporary exhibitions designed by Renzo Piano, the museum will have the opportunity to reorganize its permanent collection and reintroduce it to the public. Let's hope that it will be as successful as last year's reinstallation of the galleries of 20th century art. One also hopes that this museum, so much a part of our city's identity, will be more forthcoming about its plans to sell artworks from the permanent collection. American museums periodically do sell lesser quality works from their collections in an attempt to raise funds for new acquisitions. However, it's usually done very discreetly and hush-hush, and that’s definitely the case now with LACMA's latest decision to sell Old Master paintings by three major 17th century European artists: Rubens, Ter Borch, and Pieter de Hooch. I didn't know about this until the recent New York Times report of their sale at Sotheby's upcoming auction in New York. Checking out the Sotheby's catalog, I found reproductions of these paintings and thought that they were rather attractive. The question is why the museum didn't consider such a sale as an opportunity to build closer ties with the community, helping us understand how the decision was made and why the curators zeroed in on these three paintings. Was it because they are not first rate, or maybe because they are in poor condition and heavily over painted? In short, I believe the museum missed out on the chance to educate us, its faithful public. Perhaps if the museum organized a special one-day seminar displaying the paintings and discussing their artistic value and the reason for their de-accessioning, then a local collector might be inspired to purchase them, and Los Angeles would be better for it. And while we're talking about the need for transparency in our museums...I hear rumors that MOCA, in a continuing attempt to sort out its financial mess, not only eliminated the curatorial department for design and architecture, but last week, let go its librarian and even its registrar. It definitely doesn't make sense: a museum without a registrar is like a restaurant without a cook. As of this afternoon, my request for information regarding this matter from the museum press department was left unanswered.